I agree -- of course, it generated more or renewed interest, but at what cost to the credibility of all concerned. anyone but LE has access to that info, so im guessing the PI co.
the LE WTH, some toes prob got stepped on OUCH! I agree cw618 -- I bet some toes did get stepped on! Lately I have been distracted from the discussions taking place on the forum. It is a worthwhile distraction but a distraction nevertheless. If no updates on the current Holly Bobo topic happens within the next week ... I will probably put off accessing your maps until I can give them full attention. I get overwhelmed when I attempt to "multi-task". I must be getting old. BTW ... I still find LE's outrage over the revelation of the alleged cell phone route from and back to the Bobo property very suspicious. Think of all the online and published speculations and theories that have abound over the past two years without a word of comment from investigators. Could it be that there was a leak within the investigation from a detective who believe the truth was being covered up ... the truth that could implicate more than Clint Bobo when all the dots are connected. Thanks again for your effort cw618. It was appreciated. "The last I seen them, they were walking past those two trees back there to the left of that tree house," he said. Next, they walked down a 4-wheeler path in the nearby woods. The Bobo family dog, Champ, followed, wagging his tail the whole way. WSMV, the NBC affiliate in Nashville, has issued a correction to a series of reports on the disappearance of Holly Bobo that have aired over the last month. The station reviewed the reports after the Tennessee Bureau of Investigation slammed them as “irresponsible and unprofessional journalism.” In the on-air correction (video above), anchor Tom Randles walked back much of the information provided from “Without Warning,” a nonprofit organization assisting the Bobo family with investigating the disappearance. Here's an older article, but it indicates the cell phone pings was incorrect. Michael Roy Wiggins was being held Tuesday on $100,000 bond in the Kosciusko County Jail. A jail officer didn't know if the 32-year-old North Webster resident had an attorney. The Journal Gazette reports that Wiggins was arrested Monday on preliminary charges of obstruction of justice and false informing. Police said Wiggins sent an email to the Tennessee Bureau of Investigation alleging a North Webster officer took his squad car to Tennessee, abducted and killed nursing student Holly Bobo and then buried her body at a farm in northern Indiana in April 2011. Police say the officer had recently arrested Wiggins. Sarasota Private Eye Kayla Sharrow Looks Into The Investigation of Multiple Missing Petite Blond Females Like Holly Bobo and Heather Hodges. Sarasota Private Eye Kayla Sharrow Looks Into The Investigation of Multiple Missing Petite Blond Females Like Holly Bobo and Heather Hodges. Last month I was invited to Atlanta GA by CNN Headline News and Jane Velez Mitchell to participate in the ongoing investigator of multiple missing petite blond females like Holly Bobo and Heather Hodges by what appears to be a serial abductor. These missing petite blond females appear to have been kidnapped by a serial abductor and this premise will be the subject of CNN Headline News and Jane Velez Mitchell new series called ‘GONE’. The race was a fundraiser for the Cohen's and Colitis Foundation of America. More than 3,500 runners were expected to participate, including country music recording artist Whitney Duncan. "I'm out here raising awareness for my missing cousin, Holly Bobo," Duncan said. Bobo has been missing since April 2011. She was last seen outside her Decatur County home with a man who was leading her into the woods. "As a family, not knowing is just an absolute nightmare," Duncan said. "So we just want everybody to keep her in their prayers." Duncan told Channel 4 News that her family, with help from search and rescue crews, continues to search for Bobo every weekend. There is a $250,000 reward for Bobo's safe return. I'm not sure what to think of this report. Did Clint really say that "two" men took Holly? I don't remember that. I don't recall reading about the animal graveyard before, but I do recall mention of the Duke cemetery. 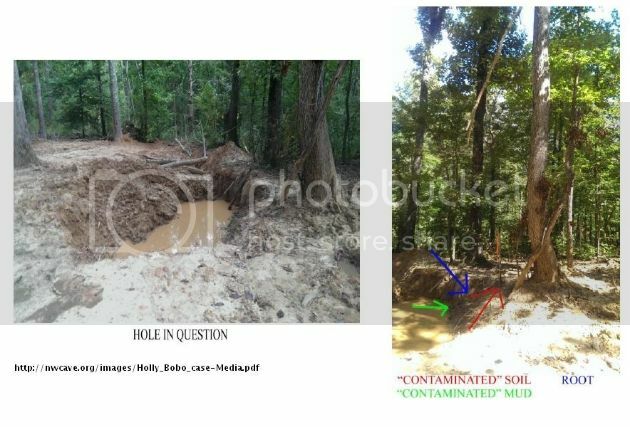 If they are close together, could that be why the soil tests indicate human remains too? Was the animal bone yard ever searched? Map showing the distance between Holly's home and the Duke Cemetery. Some of the pictures in the report are pretty graphic, so I'm just snipping the first page and the picture of the location they're interested in. The report is 6 pages and can be read at the link below. “It looks to me like there is human decomp when comparing cattle decomp against known human decomp and potential human decomp (TN suspect pit minus cattle pit spectra),” said Dr. Jacqueline A. Aitkenhead-Peterson Associate Professor of Nutrient and Water Quality Management Department of Soil and Crop Science at Texas A & M University College Station, TX who was retained by the team to review their findings of the soil and the whereabouts of where they believe Bobo’s remains may be found. 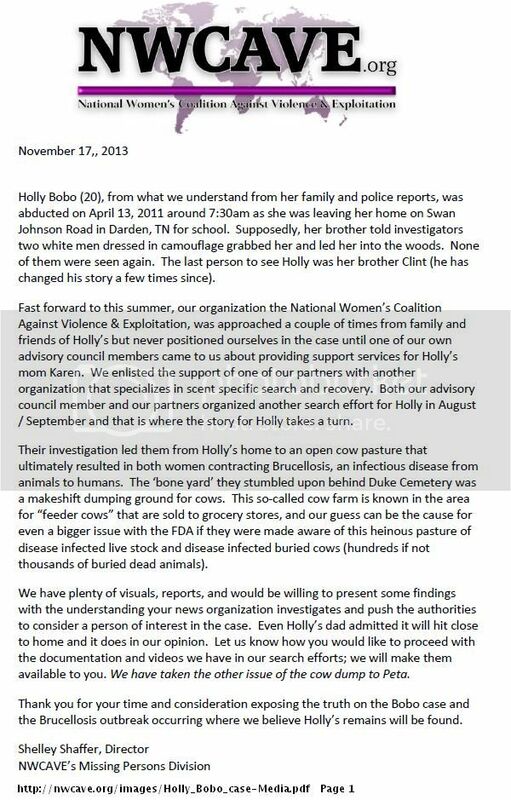 “With the reports from Dr. Peterson along with investigation reports since Holly’s disappearance, it’s our hope that law enforcement will take the findings seriously and begin digging in the area in which we believe Holly may be located,” said Kathy Johnston, the family’s private investigator and one of the women who’s organs are shutting down from contracting Brucellosis. All Karen Bobo wants for Christmas is information, one tip that will bring her daughter home or bring to justice the person or persons responsible for her abduction. Bobo spoke with The Jackson Sun on Monday. She said $250,000 will be given as a reward for whoever provides information that leads to the arrest and conviction of anyone responsible for the abduction of her daughter, Holly Bobo. Holly was abducted at age 20 on the morning of April 13, 2011. Holly was last seen being led away from her home in Darden, in Decatur County, by a man dressed in camouflage. Previously the reward had been offered specifically for information that led to Holly’s safe return. Karen Bobo said on Monday that as a family she, her husband, Dana, and son, Clint, still pray for Holly to come home, but they realize information about Holly’s abductor or her abductor’s arrest might bring her home as well. “We may have to find out who took Holly before we can find Holly,” she said. Thank you for the update grace-land. Holly is not forgotten. We're still waiting for her to be found and justice to be served. My heart goes out to her family and friends. I hope they get the answers they need soon. I agree Muffy, she is not forgotten. If you typed in the address, used a bookmark or followed a link from another site, it is possible the page no longer exists at this location. This site Copyright 2013, WBBJ-TV/DT, a Bahakel Communications, Ltd. station. The Tennessee Bureau of Investigation is executing a search warrant in relation to the disappearance of Holly Bobo, according to Illana Tate, spokeswoman for the TBI. Tate said she cannot give any further details and can only confirm that the TBI executed search warrants at various locations in connection with the case. "To say we have a suspect in this case would be premature," she wrote in an email "We have been working leads on this case which led to the search warrant executions. There is no other information about this case that I can release." NASHVILLE, Tenn. – The Tennessee Bureau of Investigation said they have executed several search warrants in the case of Holly Bobo, a missing nursing student who disappeared from her family's home in Parsons in April of 2011. On Friday morning, the TBI said they executed the warrants simultaneously at various locations. No other details, including locations, were released; however, sources said the TBI is searching a property off exit 126 on I-40 toward Parsons. A prayer service is planned for Saturday at Corinth Baptist Church from 7 a.m. to 7 p.m. Anyone with information about Holly's case is urged to call 1-800-TBI-FIND. A $250,000 reward is being offered in the case. (Nashville, TN) The Tennessee Bureau of Investigation confirms search warrants were executed today in the case of Holly Bobo. The locations of where the warrants were executed have not been released. WBBJ-TV reports the TBI is blocking entrance to property near exit 126 off of 1-40 toward Parsons. The home is owned by someone who is said to be good friends with Bobo’s cousin. Holly Bobo who was 20 years old when she mysteriously disappeared from her home in Parsons, Tennessee in April 2011. Holly’s brother Clint said he saw her led into the woods by a man wearing camo. He said it was too far to clearly identify who was with his sister. There have been many tips in the case but nothing that has led to significant evidence. Page created in 3.418 seconds with 20 queries.